The Cascade Whitebait Company had its beginnings in the mid 1940's when firstly Ted, then Bruce, Buchanan went fishing with Ted Schofield at "The Junction". The whitebait was packed out on horseback. 1954 Marked the beginning of airfreighting whitebait from the Cascade River. 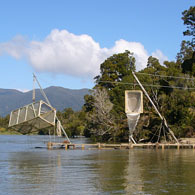 Today Cascade Whitebait has a dedicated premises in Christchurch where the whitebait are packed and shipped all over New Zealand. Whitebait is caught and chilled almost immediately. It is then packed and flown to Christchurch to reach the markets within 24 hours in the very best condition. Cascade Whitebait Shop is open for fresh whitebait from 1 September - 14 November, 9 am - 5 pm Monday - Friday. 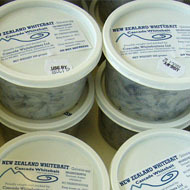 Frozen Whitebait is sold year round, subject to availability. Fill in the online order form. Fresh whitebait available from 1 September - 14 November. Frozen Whitebait year round, subject to availability.